Can elite endurance athletes say no to meat? After racing in a grueling Ironman triathlon in Lake Placid a few years ago, Angie DeFilippi, of Colchester, had to visit the medical tent. The 33-year-old triathlete wasn’t injured; her blood pressure had just dropped significantly, and she needed to balance her sodium and electrolyte levels. Swimming 2.4 miles, biking 112 miles and running 26.2 miles in one day tends to take something out of you. Inside the medical tent, a volunteer offered DeFilippi some chicken broth. DeFilippi, who in addition to being an elite amateur racer is a vegan, politely declined. “But it doesn’t have any chunks of chicken in it,” the volunteer said sympathetically. DeFilippi again rejected the broth. The kindly volunteer persisted. “She was almost offended that I didn’t take it,” DeFilippi says. After 12 years of a eating a vegan diet, DeFilippi is used to people not understanding, especially in the athletic world. Despite the fact that many athletes have chosen a meat-free lifestyle, the notion that you need to eat meat to compete persists. That might have been the conventional wisdom among experts 25 years ago. But now DeFilippi and others of her ilk are proof that the words “vegetarian” and “athlete” do not have to be mutually exclusive. Today’s sports nutrition for vegetarians looks very much like the general recommendations of contemporary dietetics — whole grains, fresh fruits and vegetables, minimal dairy products. 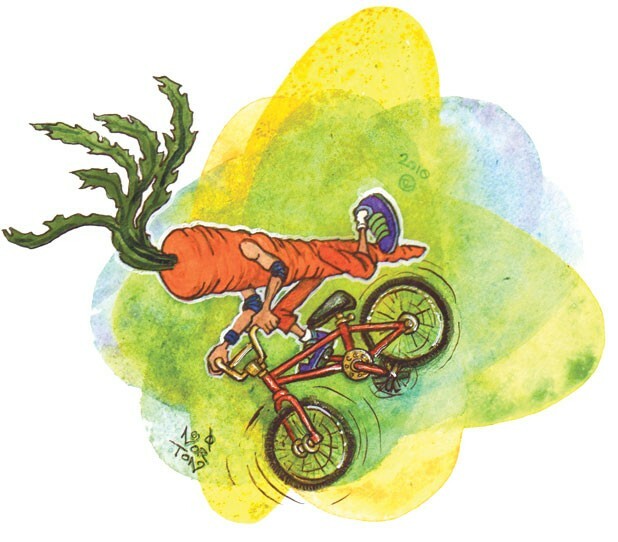 Increasingly, experts view vegetarianism as a viable option for endurance athletes who don’t want to feel weighed down by meat, and who value whole foods and a localvore approach. Typically, Evans says, clients overestimate the amount of protein they need. But excess protein will be metabolized and stored as fat. For an average endurance athlete, 1.3 grams of protein per kilogram of body weight is appropriate. That means a 125-pound female should be eating about 75 grams of protein spread evenly throughout the day. In real-food terms, a quarter cup of nuts is 5 grams of protein, a half cup of beans or tofu is 7 grams, and a tablespoon of peanut butter is 4 grams. During periods of intense training, Evans recommends her vegetarian clients get 1.6 grams of protein per kilo per day from plant-based sources, animal products (dairy) or both. Plant-based protein has a lower amino- acid profile than dairy but is an excellent source of fiber and antioxidants, Evans says. For vegans, she suggests increasing protein goals by 30 percent to get sufficient nutrients. Evans, an avid marathoner, likes to use the “plate method” to ensure that her athletes get the right proportion of protein to carbs. Only one-quarter of the dinner plate should be protein. The rest should be carbohydrates. Evans recommends all her vegetarian athletes take a multivitamin, as well as vitamins B12 and D — essentials in which vegetarians are often deficient, since they occur naturally only in animal products. But she encourages her athletes to get every other vitamin and nutrient from their food. DeFilippi came to vegetarianism and veganism gradually about 15 years ago. For health and ethical reasons, she slowly phased meat out of her diet. But when she completed her first triathlon, in 1999, she admits she lacked an understanding of sports nutrition, particularly as it relates to vegetarians. “I knew nothing about fueling properly,” she says. After her first race, DeFilippi did her homework. She already knew how to eat a balanced vegan diet, but she needed to learn how to keep her body going for hours of extreme activity. What she discovered was that she had to eat more. Luckily, DeFilippi’s job as a computer programmer at Fletcher Allen Health Care allows her to eat a lot. And often. “I’ve eaten more by 7:30 a.m. than most people eat in a day,” she says. After waking at 4 a.m., DeFilippi eats oatmeal and half a bagel with almond butter for breakfast. Then comes her first workout of the day. On the way back, DeFilippi downs a fruit smoothie. Once she gets to work at 7:30 a.m., she’ll eat a second breakfast, which typically consists of another bowl of oatmeal or some other type of grain — barley, millet or quinoa. Lunch isn’t huge, generally a salad and a sandwich. Between lunch and her afternoon workout, DeFilippi eats some nuts and fruit. Dinner is usually a “giant salad” composed of greens, onions, tomatoes, peppers, celery, beans, tofu, raisins, nuts and seeds, topped off with some flaxseed oil. Since she completed her first of 18 Ironman triathlons in 2000, DeFilippi has been eating this way. And she’s getting results. In May, she finished second out of 63 women in her age group at an Ironman in St. George, Utah. She was one of just 71 women, in a total of 1637 competitors, who qualified for the Ironman World Championship in Kona, Hawaii. Like DeFilippi, elite ultramarathoner Aliza Lapierre became a vegetarian somewhat by accident. The 30-year-old teacher and Williston resident found herself cutting meat and other animal products from her diet until her meals were completely plant based. During the same time, Lapierre got hooked on running. But basic, 26.2-mile marathons weren’t enough. Calibrating her meals to ensure she got the proper nutrients was hard in the beginning, Lapierre says. Bagels and other breads initially made up the bulk of her diet. But, after breaking her femur in a fall during a 50-mile race, she realized her nutrition was lacking. Doctors told her she’d probably had a stress fracture before the race — one brought on by inadequate calorie intake coupled with uneven distribution of nutrients. The accident left Lapierre with a lot of time to think — and to work on creating a more balanced vegetarian diet. With the help of a nutritionist, she realized she needed more complete proteins and calcium. She began eating smaller meals more often. Now a vegan, Lapierre sticks to a regimen that looks a lot like DeFilippi’s. Breakfast is typically oatmeal with blackberries and some almond milk with soy protein mixed in. Her midmorning snack consists of a bagel with peanut butter and jelly. Lunch is a large salad with tofu or tempeh and a sandwich. After an afternoon snack of hummus and pita bread, Lapierre makes dinner with whatever her garden provides. Throw in a side of lentils or couscous and some tofu or tempeh, and she has consumed just the right balance of protein and carbs for the day. While Lapierre’s vegetarian diet hasn’t hamstrung her performance — she recently came in second place in the Vermont 100 [mile] Endurance Race and was the first Vermonter to finish — it has made races a logistical challenge. Typically, Lapierre precooks all the meals she’ll need before and after the race. Depending on the race, that could be six to eight meals she makes in advance. “It’s a lot of packing and planning,” she concedes. In advance of the upcoming TransRockies Run, a six-day running stage race in Colorado, Lapierre had to contact the race caterer to ensure her dietary needs could be accommodated. She was assured they would be, but she’ll still pack as much of her own food as possible. For Peter Kamitses, a professional rock climber and near vegetarian — “once in a while” he consumes fish — maintaining his diet while traveling has never been an issue. Nor has his plant-based regimen proved detrimental to his sport. He’s eaten this way for the past 19 years and is considered one of the top free climbers in New England. The 34-year-old believes in eating a diet rich in fresh fruits and vegetables bolstered by whole grains, nuts, seeds and legumes. He gets plenty of protein from his meals and eschews protein supplements, believing them to be burdensome to the body’s digestive system. “I believe it is always better to get your balanced nutrition from whole food sources,” he writes in an email. Kamitses, of Burlington, occasionally takes vitamin D and omega-3 fatty acid supplements as well as herbal bitters and tonics made by his wife’s company, Urban Moonshine. He says he gets everything else he needs from plants. Without meat and dairy, athletes like Kamitses do just fine. Nutritionist Evans points out their vegetarianism is actually a boon, because it forces them to think more carefully about what they’re putting in their bodies — something she believes is essential to maximum athletic achievement. Vegetarian athletes are most likely to become deficient in the following vitamins and minerals, with deficiencies more common in females: vitamin D*; riboflavin; calcium; vitamin B12*; iron and zinc. *Vitamin B12 and Vitamin D exist naturally only in animal products, so a multivitamin or fortified foods are recommended for vegetarian athletes.